Meera - The plan for a hydrogen economy involves the increased use of hydrogen as a fuel for transport, particularly in hydrogen powered cars. 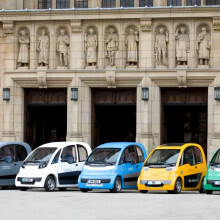 However, in this context, hydrogen isn't used as a direct energy source like coal or oil, but is instead used as an energy carrier and it needs to go through a fuel cell in order to produce the electricity needed to power a motor, as Aman Dhir explained when I met him on campus alongside one of the university's hydrogen cars. 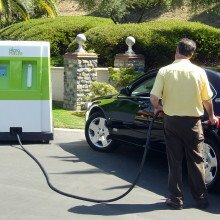 Aman - There are 6 different types of fuel cells and the simplest to explain probably is a so-called proton exchange membrane fuel cell (PEM fuel cell), which conceptually just joins hydrogen ions and oxygen ions together to produce water and the electrons are then released around an external circuit which can be used in the application. 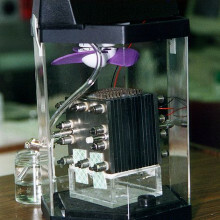 The fuel cell is made up of several different layers. The so-called membrane electrode assembly which consists of a catalyst layer, a gas diffusion layer, and a membrane: times 2. So you have a catalyst layer and a gas diffusion layer on both sides of the electrode. One electrode is used for the fuel, so in this case, hydrogen so H2 comes in and is broken down to H+ ions. On the other side, the air comes in and oxygen is grabbed, so it's the oxygen side. The oxygen O2 is broken to O2 - and the H+ ions migrate from one side through the membrane and join with the O2 - on the other side to produce the water and the electrons then travel around the external circuit which can then be applied to any load that requires electricity such as a motor, a light bulb, whatever. Meera - Well we are in the engineering lab here at the university and you've got a hydrogen car in front of us. So it's about the size of say, a smart car. Aman - So it's approximately 2 ½ meters in length and about 1 ½ meters to 1.8 meters in height, and about 1½ meters in width. So yes, it's a super mini-sized vehicle. Meera - How is this really designed then? So you've got the fuel cell here at the front of the car. How is this all combined together to make this car move? Aman - Well, the powertrain behind this hydrogen hybrid vehicle - the key thing it's actually a hybrid; it's not a pure hydrogen vehicle - is that the fuel will come in and be stored in a hydrogen tank at 350 bar. It is then fed into the fuel cell and the fuel cell does its job of converting the hydrogen into H+ ions and then the electrons are freed. And the electrons then go forward to either charge a set of batteries or power an electric motor. 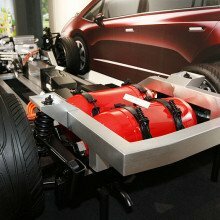 So primarily, it will charge an electric battery and the batteries will then drive the motor, and the motor then drives the wheels. So this vehicle will give you a 0-60 of 6.1 seconds. So essentially, it's no different to an electric vehicle. 80% is similar. The only difference is that you don't plug it into a wall to get your electricity. We generate our own electricity on-board. Meera - The hydrogen used by the fuel cell is compressed and stored on-board the vehicle within a cylindrical tank holding 600 grams of the gas at a pressure of 350 bar or roughly 345 atmospheres. But because hydrogen is highly flammable, the design also needs to take this into account. Aman - Along each step in the design is designed to the ISO standards. It is as safe as any other vehicle on the road, if not safer. Meera - What does the tank consist of? What say, makes this safe? Aman - This tank is actually extra light. It's road aluminium reinforced with carbon fibre and Kevlar, so the thing is bullet proof. It's that well-designed. If you compare that to let's say a plastic petrol tank or diesel tank, if you don't get out of your vehicle within 4 minutes, they'll assume you're dead because they're designed to collapse after 4 minutes. This thing will stay alive, so you are inherently safe in this vehicle. Meera - Despite the safety on-board, the storage of compressed hydrogen within these tanks has its own set of problems which Alex Bhevan is trying to overcome. Alex - The key thing with hydrogen is it's a storage in a small space using as little energy as possible to store it. If we look at 1kg of hydrogen, 1kg of hydrogen will occupy around 11 cubic meters that's STP which is standard temperature and pressure. What we want to do is to be able to store 1kg of hydrogen in less than 11 cubic meters. Meera - What are the problems of compressing it so much? Alex - Well as you compress hydrogen, obviously, you're going to consume energy in the compression process if you move the mechanical pistons. And currently, with the sort of compression technology we have, around 15% of the usable energy from the hydrogen is lost on compression. Meera - As a result, scientists are already looking into alternative materials that can store and release hydrogen gas efficiently including structures called metal organic frameworks or MOFs and also, carbon nanotubes. But Alex is looking into the potential of other materials or compounds that store and release hydrogen readily; compounds known as metal hydrides. Alex - If we use metal hydrides, this can offer a very low pressure storage technology and it's possible to use at very low pressures. In fact, at such a low pressure, it can be lower than the pressure in a car tire and yet, we can store a vast quantity of hydrogen in a very small space. Meera - How do these really work to store hydrogen? Alex - Okay, well if we take a metal like magnesium which is very good at storing hydrogen - it can store up to a maximum of around 8% w/w of hydrogen. The process is, you get gaseous hydrogen above the metallic magnesium. This hydrogen sort of disassociates and goes into the magnesium crystal and packs at very discrete sites. That's a metal hydride. Meera - And is this possible in a range of metals? Alex - Sure. I mean, all metals can absorb hydrogen to some extent, but some are very good absorbing hydrogen. Meera - And how would this work? So the hydrogen can I guess easily go in and be captured within the metal, but you'll want it back again. So how easily I guess is it released? Alex - Thankfully, we have a lot of these materials. Some of them operate at room temperature and an equilibrium is formed between a gaseous phase above the metal and the hydrogen stored within the metal. So as we reduce the pressure outside the metal, hydrogen then comes out of the metal to reform this equilibrium. It's very similar to a butane gas lighter. If you look at that where you got an equilibrium between the liquid butane and the gaseous butane above. Meera - It sounds very feasible, so the hydrogen goes into these metals and then you change the pressure above it and it comes back out when you want it. What are the challenges? What are limitations? Alex - One of the key challenges is to get this material into the automotive applications and that particular application, weight is absolutely critical. And these materials can absorb a reasonable amount of hydrogen but they are heavy, and what we have here, this is a metal hydride. This one is based on the elements of lanthanum and nickel. And this stores around 1.4% w/w of hydrogen. As you can feel, it's quite heavy. Meera - Yes, extremely heavy in fact. So what this is - it's quite a small bottle, say about 15cm in height but packed quite densely with this hydride, and it's extremely heavy. It's really causing quite a drop in my hand as I hold it. Alex - Yes, we need to sort of continue our quest to develop new materials and search for new materials that can make life a bit easier. Meera - While the search for lighter storage materials in cars therefore continues, the use of metal hydrides to power boats has been found to work well. But there's another fundamental issue for those hoping to own a hydrogen car. Alex - You're used to the fact of petrol stations being every 3 miles from your house or from wherever you are. 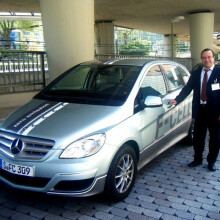 Rafael - Currently, the main uses of hydrogen are within the chemical industry. Rafael - For ammonia, or hydrogenation processes in the oil industry or as a fuel in rockets. Its current amount is about 50 million tons per year. If we use hydrogen as a fuel for transportation, this amount will increase significantly. So, we need to find methods, environmentally friendly methods to produce hydrogen to cover that potential demand because actually, hydrogen is mainly produced from fossil fuels from methane, the steam reforming of methane and eventually, methane is also a fossil fuel that is depleting and we need other sources for hydrogen production. Meera - This is where the work of the biosciences and chemical engineering departments at the University of Birmingham comes in. Researcher Mark Redwood is working on obtaining hydrogen gas from a natural and widely available source: biomass, obtained from organic waste. Mark - The thing about organic waste is it's really diverse. It's all sorts of different things. For example, there's the caterings wastes, the plate scrapings that come off the plates in kitchens and after the whole BSE problem, you can no longer feed that back to animals because you might accidentally feed pork back to a pig. 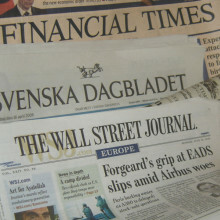 So nowadays, there's a lot of regulations and difficulties with disposing of all sorts of kinds of wastes. There are things like apple pomace, or spent grain that comes out of brewing, just excess food that doesn't get eaten or go spoils in the supermarkets. Altogether, there's over 100 million tons of suitable biodegradable wastes every year just in the UK. Meera - And so, how would you set about turning this into hydrogen? Mark - We would build what we call an integrated biohydrogen refinery where we'd use a diverse range of techniques to squeeze any sort of organic wastes or biomass into different fractions. And then ultimately, all of those get put into a bioreactor using special bacteria of different types to turn the waste into hydrogen. It's about using the calories, using the food value in all different sorts of wastes to make the bacteria grow and to produce hydrogen. And then there are special ones that also use sunlight for an extra boost. Meera - And so, what's the actual process? So what is it in the food waste that's then converted into hydrogen and what else do you get as a by-product? Mark - Well, in any form of bio waste, it's the same feedstocks that give us food value when we eat food. It's the carbohydrates, the proteins, the fats, all those things are suitable for bacteria to breakdown and grow, and make into hydrogen. Now, what we do is we start off with something that's quite sugary. First thing we do is put it into a fermentation which is like what happens when yeast works in brewing where you use E. coli bacteria or other bacteria in a dark fermentation, break down the sugars and produce hydrogen and carbon dioxide, and a bit of bacterial growth. Meera - And when you say dark fermentation, you basically just mean without light. Mark - Yeah, just without light. Meera - And fellow scientist Rafael Orozco is leading the work using bacteria in this dark fermentation process. Rafael - There is a range of bacteria that can do the job, converting the sugars to hydrogen. We used facultative anaerobes, so just E. coli, in different strains of E. coli because these are very easy strain to work with. It's easy to grow and the fermentation conditions are mild. For experiment purposes, it's a very, very useful microorganism. Meera - And what does this E. coli work on? So it takes sugars and what does it do to then somehow get hydrogen and other by-products from it? Rafael - It converts sugars to hydrogen and a mixture of organic acids, following a specific metabolic pathway. Meera - And how efficient is that process then? So, for all of the sugars coming in, how much hydrogen do you get out from this initial use of bacteria like E. coli? Rafael - Well in this case, the maximum yield will be like 2 moles of hydrogen per mole glucose through the development of our fermentation techniques and culture media and conditions, we have achieved continuous fermentation with 80% of that maximum potential. Meera - Whilst this dark fermentation is showing good yields of hydrogen, the team are now further improving on the efficiency of this process by using the organic acids released when their E. coli bacteria breakdown these sugars. Mark Redwood again. Mark - Now, the dark fermentation also produces organic acids. These are things like vinegar or butyrate. These organic acids are the preferred foods for photosynthetic bacteria, purple bacteria that use sunlight to convert the waste product of dark fermentation into hydrogen. And actually, if you took all of those organic acids from a dark fermentation and put them into the photo fermentation using sunlight, you'd get about 5 to 10 times as much hydrogen from the photo fermentation as you got from the dark fermentation. Meera - So, how do you focus in your research in this area? So you've shown that it can produce so much more hydrogen. So what do you actually look into to make this happen on a larger scale? Mark - Well, at the moment, we're developing reactors that can be used to take the technology out from the lab into the real world and a big part of that is that these reactors will have to be very large because sunlight itself is not that intense. So, in order to get a lot of sunlight energy, you have to cover a lot of space. And we've come up with one solution to that problem and which is what we call dichroic beam sharing and it uses a really well-known bit of technology called the dichroic mirror. So, I've got one of them here and that's why we're outside in the sunlight. And we've got a little 2 inch across circular mirror. It's just a normal piece of glass which has on it an organic coating which is a dichroic coating and that interacts with the sunlight and it splits it. So, some of the wavelengths, some of the colours get transmitted and some of the colours get reflected. This is actually really useful because those colours can be fed to different organisms making different biofuels because some organisms like to use red light and some organisms like to use other colours of light. Then it happens to be that the purple bacteria that are really good at using organic acids work really well on the reflected light and other things - like algae, green things, higher plants, grass, crops - those work really well on the transmitted light which is mostly red. So, that means if we could use this dichroic mirror to split sunlight, we can drive 2 bioreactors in the same space and effectively double the amount of biofuel it can produce without needing anymore land. Meera - So this is very much a multistep process, bringing different biological processes together. That was Mark Redwood from the University of Birmingham. 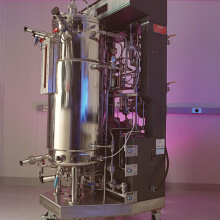 Meera - Bushra uses water at high temperature and high pressure to chemically break down this complex waste and release hydrogen in a process known as water gasification. Bushra - My research area is in hydrothermal processing and this is the treatment of waste by using high temperature and high pressure in the presence of water. We're talking about over 500 degrees and over 250 bars. Hydrogen is actually an ultimate product that has to come out from a very complex starting material. Meera - And do you have an example say, perhaps of a breakdown to the kind of simple molecules that come out and then the complex ones that are left behind? Bushra - An initial waste biomass which is called scientifically, lignocellulose. Now 'ligno' resembles lignin. Cellulose is a very complex carbohydrate. Cellulose is a subcomplex. Ligno is another subcomplex and then the cellulose breaks down into sugars like sucrose and it also breaks down into other types of sugars that are not edible, but they are chemically sugars. So, these cellulose can be treated in a process. What treats cellulose is not enough to break lignin. Meera - This is where your work comes in. Bushra - Yes, because lignin is very complex. Meera - And at this say, high temperatures and high pressures, you're actually using water to get the hydrogen out of the lignin. Bushra - Yes. 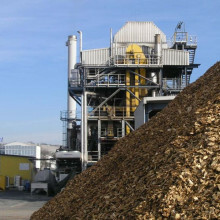 Actually, this is, if you like, the advantage of it because when you treat waste biomass, you have to dry it first in order to burn it or to do like pyrolysis or gasification. You have to actually dry it. And this is a very costly process to get water out of it. What we do, the water that wets biomass, that water acts as a medium. It actually acts as a catalyst because when you compress it and heat it, it will actually dissolve all this. It does facilitate the gasification and the word 'gasification' is turning all these chemical compounds, lignin, et cetera into, majorly, hydrogen. Meera - And the use of say, these high temperatures and high pressures, you're actually reaching a phase of the water known as 'super critical phase'. Bushra - Absolutely. The super critical phase means it's the whole thing is actually in a gas phase, but more than that, it's a gas phase with different chemistry. I.e. it will follow different reaction paths to give us hydrogen. Meera - What do you hope perhaps will be, I guess almost the level of hydrogen you could achieve? Do you imagine that this will be quite an efficient process? Bushra - The main attraction behind actually going to that level of temperatures and pressures is over 50% yield of hydrogen because this process does not give us any chars and tars. Meera - So, nice clean hydrogen gas at the end. Meera - So, chemical processing enables the team to branch out to a wider range of waste. Chemical Engineer Bushra Al-Dhuri is exploring these untapped sources of hydrogen. Bushra - Wastes come from various sources as we know. There is the kitchen waste, there is the municipal waste, and with this, we're talking about cardboards, papers, all sorts of things. Now industrial waste means like paper waste because it is also a cellulosic material and then we have wood, wood chips, wood that is used for old cupboards, all sorts of woods, also going further to forestry. Meera - Simply raising the temperature and pressure of water can cause drastic changes to its reactivity as Gary Leeke showed me when I met him in his lab. Gary - 'Super critical water gasification' is a fancy word for superheated water really. Water, as you know, exists as a liquid in ambient conditions and a vapour. We don't really see the vapour unless you get steam. If we were to heat water above 374 degrees C and apply sufficient pressure, we end up with a supercritical state for water. So the pressure we need to apply is 221 bar. So, it's quite large pressures and reasonably high temperatures. But at that condition, water changes its properties totally. So you know water, being a polar solvent, it can't really dissolve organics, but at that condition in the super critical state, we can start to dissolve organics. It totally changes from being a polar solvent to a non-polar solvent. Meera - So, by heating water to these temperatures and raising it to such high pressures, you're changing its properties in a way that it becomes a solvent and it's reactive. Gary - Yeah. We actually use it as a solvent and it also as you rightly say, it becomes reactive to attack bonds. And we can also accelerate this process further. As well as having the temperature and pressure, we can also add a catalyst into the system as well to speed up the actual gasification process because we want this to occur in probably about 2 or 3 seconds maximum. Meera - So the fact that it can break bonds in this way is where it comes in use with the biomass that you're working with because that's quite a complex structure and the super critical water will break that apart and break the bonds within. Gary - Yes, that's correct. So, water as we know now is in a super critical state is super reactive. We have a lot of these OH- and H+ floating around that we can use to break the bonds and its very complex structure. Meera - The main selling points of a hydrogen economy are that it's an environmentally friendly way of delivering energy. So when high temperatures and pressures are required for its production, it's easy to question whether we should be promoting it. But the efficient rates at which hydrogen is released and the many ways in which this process can be integrated into current waste management systems keeps hydrogen at the forefront. Gary - The majority of plants contain a large amount of water within their structure. So, if you were to burn that, a lot of the energy is actually used to drive off the water in the first place. We actually relish the water that is there and actually use it in the process. 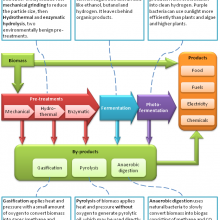 So, for wet biomass feedstock, this is very viable option to create new chemicals. Meera - So, this is a pilot scale that you've got here in the lab. What would be the next steps to get this going on perhaps a more industrial scale? Gary - We're working with industry on this. I can't mention the company's name. They have a feedstock which due to legislation can no longer be put in landfills or spread on lands, so they're looking for a viable option to actually get rid of this feedstock and raise other chemicals from it, i.e. gaseous feedstocks that they can then use to raise energy themselves. Basically, they get a double bonus. They don't have to pay the actual disposal cost to give to landfills and they create a feedstock that they can actually sell. Meera - You're listening to a special edition of the Naked Scientists with me, Meera Senthilingham. This week, we're exploring the role and production of hydrogen in the race to find green sources of energy. We've heard so far about the many roles bacteria can play in converting various organic sources of waste such as food waste into hydrogen for use thereafter in hydrogen fuel cells. But whilst the use of bacteria shows high efficiency in breaking down simple organic waste, like sugars, the ultimate aim is to tackle more complex forms of waste as well in order to produce the maximum amount of hydrogen possible and from a greater diversity of currently unused resources. But therefore, this is also where the process becomes more complicated as Lynne Macaskie explains. Lynne - If we go to a more complicated waste like an agricultural waste then that's more likely to be starch or cellulose, and that presents some problems because many microbes actually don't like starch or cellulose. They prefer sugar. So, often what you can do is treat the starch or cellulose beforehand to make sugar or you can actually have mixed cultures. You can use microbes that act at high temperatures for example, or use a chemical system beforehand to break down the cellulose. Meera - Chemical processes are the main focus at the moment, not only for waste containing cellulose but also lignin found commonly in wood waste as these compounds are also more complex. Too complex in fact, the bacteria which are much better suited to metabolising simple sugars. Lynne - The microbial routes, it's very eco-friendly, but it's a bit restrictive because breaking down for example lignin, the component of wood, is still very problematic because it's quite hard to break this down biochemically. It's very slow. So, chemical processing comes into its own when you have recalcitrant - that's difficult - materials. And often, the only convenient way to treat these is to use gasification which is basically thermochemical treatment to just completely convert the raw material into gasses. Meera - So, I guess at the moment, it's perhaps the chemical process that's more accessible or more feasible. Lynne - At the moment, chemical processing is the main contender, but I see a future for biotechnology. In fact, I see a future in hybridising the two technologies together so that biotechnology can look at a fraction of the waste and chemical processing can look at the fraction which bacteria may find it harder to look at. So, it's horses for courses really. I mean, each waste is going to be completely different. 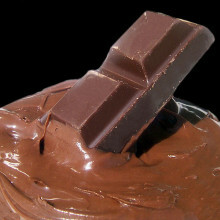 A chocolate waste is very easy to treat biologically. Wood waste is not. And really, that's the cutting edge of this area at the moment - how do we treat very difficult waste? Meera - But this integration doesn't stop at the production of hydrogen gas. Bacteria are also being used to produce components of the hydrogen fuel cell itself. When converting hydrogen to electricity, fuel cells use catalysts made from metal such as platinum and other platinum group metals to speed up the reaction. But now, a new development in the field of biomaterials is converting bacteria into these catalysts. By combining bacteria with small traces of these metals, Angela Murray, is producing a new generation of materials known as biocatalysts and reducing the demand on this scarcely available platinum group metals. Angela - Platinum and in particular the platinum group metals are a unique group of metals because the price of them is very high and over 75% of the world supply is based in South Africa. So as a result, it means there's a focus on recycling these strategic metals. We use a number of sources. One of which is road dust because your car catalytic converter actually loses somewhere between 30 and 70% of its platinum group metals over the course of its lifetime as you drive it around, and this end up into road dust. Well, to look at incinerater ashes from municipal wastes. We also look at electronic scraps. We look at industrial slag materials as well. To give you an idea, if you were to go to South Africa which has the richest deposits on Earth at the Bushveld complex, you'd find levels of about 2 to 10 parts per million pgm precious metal that's platinum group metals. Now that's the richest place on Earth and that's mined from deep underground which is both energy expensive and environmentally damaging. If you look at something, for instance, if we take the raw dust as an example, you're looking at levels of 1 to 2 parts per million total platinum group metal content and the road dust. And although that sounds low, that's approaching a low to intermediate grade mine, but the material is already on the surface of the road, it's not needing to be extensively crushed and processed, and it's ready to be collected. Meera - And so, what's the process? Angela - The technology that we've developed looks at taking that road dust after collection and physically processing it in order to concentrate up these platinum group metals, the metals we want. From all the different components of road dust that we are not interested in via magnetic separation, electrostatic separation, a gravity technique. So what you're doing is just separating on the basis of the material's, properties to get the platinum and associated metals that you want out of all the other materials there which you don't want. Meera - What are the next steps to really kind of fine-tune that and get platinum? Angela - The idea is you really have 2 options. So the first option is you can send us material for smelting which is the traditional recycling route for PGMs. Instead of taking these metals for smelting, which is obviously melting them at high temperature - it's energy expensive - we can also leech these metals into a solution so you end up with the solution of metals instead of powder, and we can then add bacteria. And these bacteria have a neat trick in that they're able to reduce the metals onto their surface. So what you end up with, if you can visualise it, is a bacteria with a little metal jacket, lots of tiny little particles on the surface of it. Meera - All of which are platinum. Angela - Well, they can be platinum, they can be palladium. You can do mixes of metals, so they're all precious metals and we call these bio nanocatalysts because these bacteria, once they had the metal deposited onto them, have a functionality in their own right. And so actually, they can be used as the platinum or palladium source for fuels cells. So we can actually make a biological based platinum catalyst which can then be used in your fuel cells. Meera - So all in all, these are biologically and environmentally friendly methods of generating both the fuel and the fuel cells. Angela - You're taking the waste biomass and you're producing a clean hydrogen to run the fuel cell, and then you're taking precious metals that have been recovered from wastes, and you're using those to produce the precious metals needed for the fuel cell. So really, you're taking 2 different waste materials and you're using it to generate clean energy. It's the whole number of projects at the university coming together to deliver this new technology. Aman - Currently, there are only 7 hydrogen refilling stations in the country and they're not very well located in close proximity. So the infrastructure is an issue and we, here at the university, are aiming to change that by putting more stations in. In fact, we are starting a new project come next autumn which will involve 100 vehicles of this size running around this country and across Europe, giving us the ability to drive from Aberdeen, all the way to Trondheim in Norway without stopping apart from for fuel. So, we're building up a network of filling stations and vehicles that will be capable of traveling distances that we want to travel. Meera - Aman's team aimed to lead by example, but if their drive to push the use of hydrogen cars in the UK and more globally is successful, the next issue is one of hydrogen availability. Next How do we use Microbes to make Biohydrogen?